With more than 40,000 different types of rice, it's hard to limit yourself to just long-grain rice. Both jasmine and basmati rice -- available in white or brown -- are aromatic rices with a nutty flavor that make a nice alternative to your usual side dish. Both jasmine and basmati rice are high in carbs and low in fat, but there are slight differences in nutrition between the two types of rice. The calorie content of jasmine and basmati rice varies widely, even when it comes to choosing white or brown. A 1/4-cup serving of dry white jasmine rice, which yields 3/4 cup of cooked rice, contains 140 calories, and the same serving of brown jasmine rice contains 160 calories. 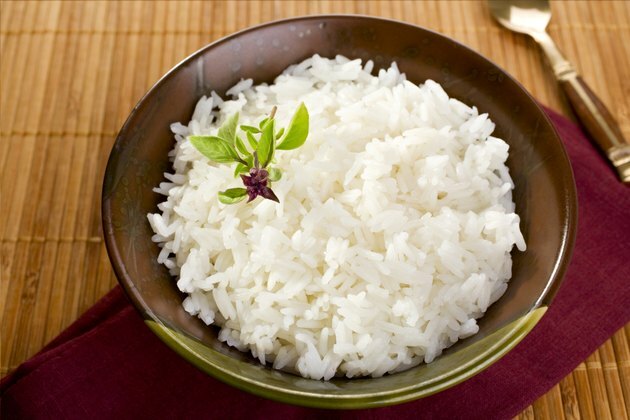 A 1/4-cup serving of dry white basmati rice contains 170 calories, and the brown basmati rice contains 150 calories. While the white jasmine rice is the lowest-calorie option, as a whole grain, the brown basmati rice makes a healthier choice. A 1/4-cup serving of dry white jasmine rice contains 44 grams of carbs, less than 4 grams of protein and 0.5 gram of fat, and the same serving of brown contains 35 grams of carbs, 2 grams of fiber, 3 grams of protein and 1 gram of fat. The white basmati rice contains 38 grams of carbs, 4 grams of protein and 0.5 gram of fat in a 1/4-cup serving, while the brown basmati rice contains 34 grams of carbs, 2 grams of fiber, 4 grams of protein and 1.5 grams of fat. When it comes to better nutrition, the brown rice version of either of the two rices makes a healthier choice because of the fiber content. Getting more fiber in your diet improves meal satiety, which helps with weight control. Iron deficiency is a major health concern, according to the Office of Dietary Supplements, and not getting enough iron in the diet can lead to anemia. Although not significant sources of iron, some versions of jasmine and basmati rice can help you meet your daily needs. The brown basmati rice contains the highest amount of iron, meeting 4 percent of the daily value per serving, while the brown jasmine rice and white basmati rice both meet 2 percent of the daily value per serving. The white jasmine rice does not contain any iron. Jasmine and basmati rice are naturally very low in sodium, containing 0 to 10 milligrams per serving. Most Americans get way too much sodium in their diet, according to the Dietary Guidelines for Americans 2010. Excessive sodium intake increases the risk of high blood pressure and heart disease.